So how has the September Shopping Challenge been going for all of you? Anyone still doing it? This week has had a few bumps, but in general, nothing to be horribly ashamed of. I did my shopping on Friday, as I said. But on Saturday, I ran out of dishwashing detergent. I had a $5 off coupon for Dollar General, so I headed back into the store, feeling very guilty-slash-giddy. The kicker for the coupon is I had to spend $30 to get the $5 off. Tricky, eh? So I decided to get things I'd need anyway eventually to make it worth the $25 I'd have to spend in the end. I bought my dishwashing detergent, some breakfast cereal, some canned goods, and then... a $5 lamp shade. Well, I just got a bed and a new room, and I had a lamp with no shade! So sue me! I also bought 3 $2 picture frames for the mantle. I know, it wasn't necessary, and I felt guilty about buying them, but I'm not sad now when I look at my three kids all framed and sweet looking above my fireplace! Sunday, after church, Fifi asked if we could get Shipley's Donuts. This was starting to become our little Sunday after-church treat, but I was strong and said 'Not this week.' (Or any other week this month.) We had to make an exchange at Walmart, and I did it without purchasing any other item. We came home and had homemade lunch like good boys and girls. No money spent. The only extras I bought were an oil pourer and a glass jar. The oil pourer (if that's even what it's called) has been on my mental list for ages. When we moved into our new house, I bought lots of cupboard items to get us started, including a mammoth-sized metal container of olive oil. It was cheaper by the fluid ounce, you see. However, it's impossible to use. I've been avoiding using anything calling for olive oil since I bought it. So spending the extra $1.59 on the oil pourer seemed reasonable. 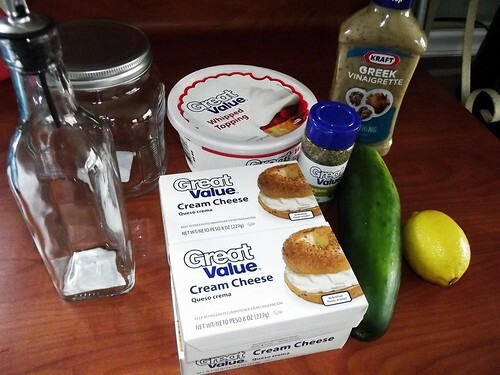 The glass jar was for my icing sugar (powdered sugar, whatever). I keep all my dry ingredients in glass jars to keep them sealed and tidy in the cupboards and the giant 2lb bag of icing sugar lying in front of my other jars was driving me bonkers. 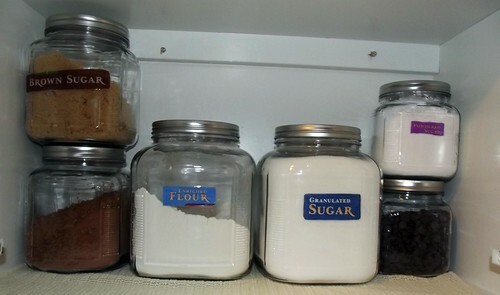 So, no, it wasn't really totally necessary, but again, I don't feel guilty when I open my baking cupboard and see my icing sugar jar resting neatly beside the brown sugar and the cocoa powder jars. It actually makes me want to sing. One day my glass jar collection will be complete. So that was Wednesday. And by the way, the Greek dinner was delicious. Today is Thursday. One more day until shopping day again. I was doing well today. I even had to run some errands in town right before lunch time, and I successfully passed McDonald's (milkshakes!) and Taco Bell (tacos!) without stopping. It wasn't until right before I went to pick up Fifi that I noticed on the calendar that tonight was my night to bring snacks to soccer practice. I had nothing at all snack-worthy for four year olds ('Here, kids, who wants a leftover Greek burger! '), so sadly, with head hung low, I drove back into town. I could have just bought boring old boring gummy snacks or Cheez-its packets, but the thought occurred to me: 'This is their last practice before their first game!' I wanted to do something extra special, so I went to Kroger and picked out some cupcakes. 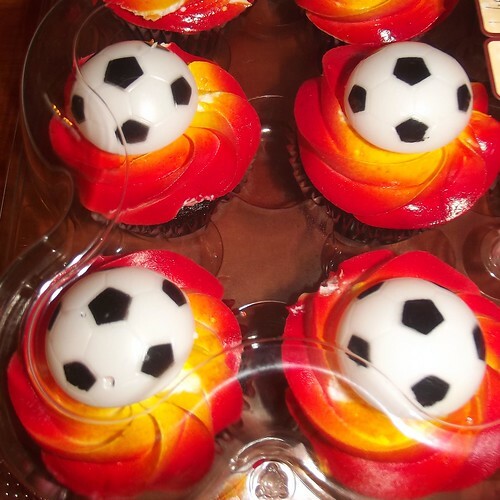 Kroger has lots of cupcakes covered in E numbers and various themed plastic rings; I was sure to find soccer balls. Well, they didn't have any soccer balls. I was just choosing between Wreck-It Ralph and Dora the Explorer when the bakery assistant asked if I needed any help. I put on a disappointed face and said in a pathetic voice that I was really hoping to find some soccer balls, but alas, there are none. Customer service being kick-A in America, she immediately offered to give me twelve soccer rings from the back to replace whichever other cupcakes I chose. So I left Kroger $8 poorer but with red-icinged, chocolate cupcakes and soccer rings. Then about an hour later, soccer practice got cancelled due to the rain. So I took the soccer balls off the cupcakes to use another day, and we ate the cupcakes for dessert.